US Army shown. All Five Branches are available. A photocopy of your DD-214 (post WW2), OR A photocopy of your WD AGO 53-55 (WW2), OR photocopy of ERB/ORB (Army), MPF (Air Force) NPC/BOL (Navy) IAW (Marine Corps), Or copy of military orders acknowledging qualification. DESCRIPTION: A silver colored metal badge, 1 31/32 inches (5.00 centimeters) in width, consisting of a dagger and arched tab superimposed over wings and a deployed 7-cell ram-air square parachute. SYMBOLISM: The dagger, a Fairbairn-Sykes knife used by the rangers and Office of Strategic Services in WWII, symbolizes infiltration techniques used by special operations forces; the arched tab symbolizes the tabs worn by special operations units; the wing suggests flight and airborne capabilities; the parachute is a depiction of an MT1-X, the first square parachute to be adopted by all military services as the standard military free fall canopy. HISTORY: The first design for a proposed military free fall (MFF) badge came in March 1983 from Sergeant First Class Gregory A. Dailey, then of Company B, 2nd Battalion, 5th Special Forces Group. 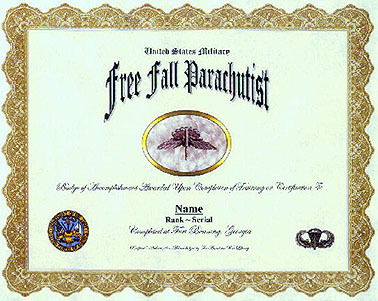 The final MFF parachutist and jumpmaster badges were developed by General Wayne A. Downing with historical assistance from Mr. James Phillips of the Special Forces Association. AWARD ELIGIBILITY: The commander in chief, US Special Operations Command is the approval authority for award of these badges. To be eligible for the basic badge, an individual must have satisfactorily completed a prescribed program of instruction in military free fall approved by the U.S. Army John F. Kennedy Special Warfare Center and School or have executed a military free fall combat jump. To be eligible for the jumpmaster badge, an individual must have satisfactorily completed a prescribed military free fall jumpmaster program of instruction approved by the U.S. Army John F. Kennedy Special Warfare Center and School. DATE APPROVED: The badge was originally approved for wear only while assigned to US Army Special Operations Command or subordinate commands on 1 October 1994 by the US Special Operations Command. It was approved for unrestricted wear by the Chief of Staff of the Army on 7 July 1997. SUBDUED BADGES: A subdued badge in black metal finish of the same design is authorized. MINIATURE BADGES: A dress miniature badge, 1 inch in width is authorized.